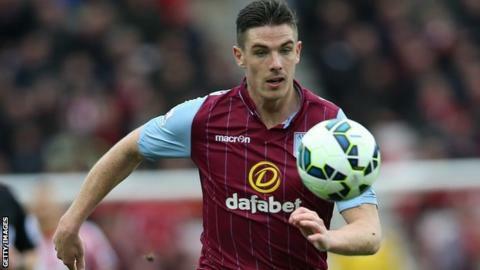 Aston Villa defender Ciaran Clark has signed a new five-year contract, committing him to the club until 2020. The Republic of Ireland international, 25, had 12 months left on his existing deal with the Premier League club. "I'm delighted to be going into the opening game on Saturday knowing my long-term future has been sorted," Clark told the club website. Meanwhile, left-back Aly Cissokho, 27, has joined Portuguese side FC Porto on a season-long loan. The former Liverpool defender joined Villa from Valencia last summer but fell out of favour after the arrival of manager Tim Sherwood, who has named summer signing Micah Richards team captain. Defender Richards joined on a free transfer after leaving Manchester City and replaces Fabian Delph, who signed for City last month, in the role. Striker Gabby Agbonlahor is Villa's new club captain. Clark, who has won 11 caps, is a graduate of the club's academy and made his debut, aged 19, in August 2009 in a 2-0 win over Fulham. He has scored eight goals in 136 appearances for Villa.